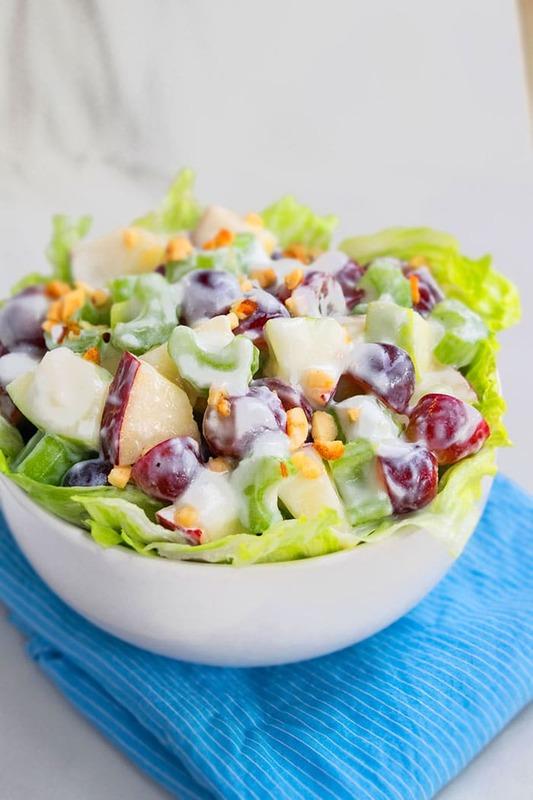 Quick and easy Waldorf salad recipe with grapes, apples, celery, walnuts, mayonnaise. A traditional classic salad from 1800’s and made in one pot/bowl. This creamy and fruity Waldorf salad might truly be one of the best Summer salads ever. It was first developed in the Waldorf Astoria Hotel in 1893 and the original recipe did not have any grapes or walnuts. Those were added later, as this salad gained popularity. It’s served on a bed of lettuce and has subtle crunch from walnuts. Usually, whole walnuts are used but I like to use chopped walnuts because they are easier to eat. This traditional Waldorf salad is a classic and the best! I usually serve it as a side dish but I have also served it as mini individual appetizers and I love to enjoy leftovers as a deliciously light snack. What kind of apples are best for Waldorf salad? Gala apples and Granny Smith apples are the best. 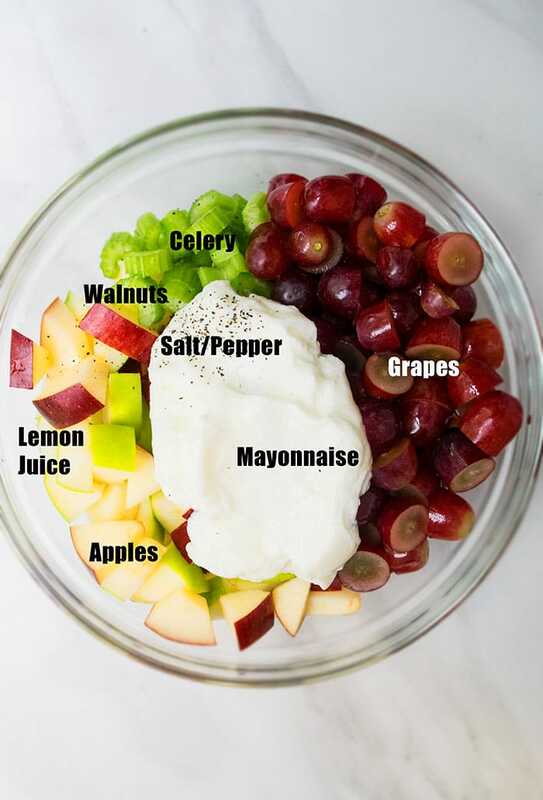 How do you make the dressing for Waldorf salad? There is no separate dressing. The creaminess comes from mayonnaise, salt, pepper, lemon juice. What is in a Waldorf chicken salad? It’s the same classic recipe but also has diced cooked chicken pieces (about 1 cup). How did the Waldorf salad get its name? It got its name from the hotel where the recipe was first created- Waldorf Astoria Hotel in New York. Cranberry Waldorf salad– Mix in 1/3 cup dried cranberries. 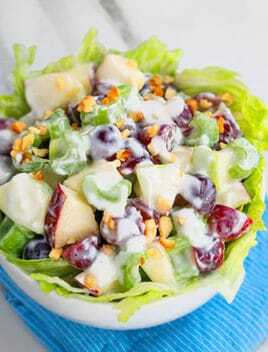 Healthy Waldorf salad– Substitute mayonnaise with full fat Greek yogurt. However, it will add a bit of a tangy flavor. It can be adjusted with honey or powdered sugar. Broccoli Waldorf Salad– Add 1 cup chopped fresh broccoli. Make other sweeter variations of this recipe by using whipped cream, cream cheese, powdered sugar and even mini marshmallows. For maximum creaminess, use full fat mayonnaise and add more to make it even more creamy. To prevent the salad from becoming too “watery,” pat the apples and grapes dry with paper towels. Toast the walnuts to enhance the “nutty” flavor. Adjust the amount of lemon juice, based on your preference. 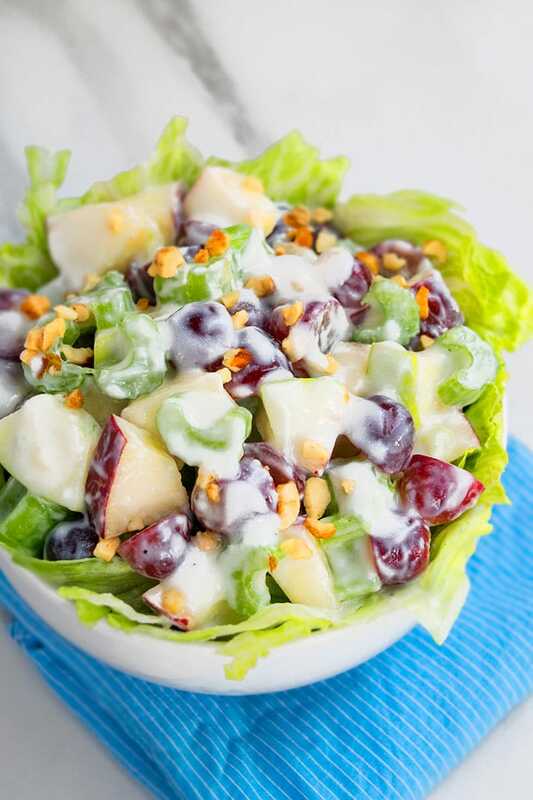 Quick and easy Waldorf salad recipe with grapes, apples, celery, walnuts, mayonnaise. A traditional classic salad from 1800's and made in one pot/bowl. In a deep mixing bowl, add the mayonnaise, lemon juice, salt, pepper and mix until smooth. Add the apples, grapes, celery, walnuts and mix everything together. Serve on a bed of fresh lettuce and enjoy. Great recipe this looks so tasty and heartfelt!! I want to try this salad! This looks amazing! Those colors in the salad say it all…. Adding to my list of must makes! One bowl is always best! Love how delicious and easy this is! Loved this. So so loved this. Great dinner!